Performers include: Guy Pearce, Mary-Louise Parker, Rachel Griffiths, Michael K. Williams, Ivory Aquino, Austin McKenzie, Emily Skeggs, Jonathan Majors, Fiona Dourif, Henry Czerny, Whoopi Goldberg, Arliss Howard, Sam Jaeger, T.R. Knight, Mary McCormack, Kevin McHale, Rosie O’Donnell, Denis O’Hare, Pauley Perrette, David Hyde Pierce, Richard Schiff, Phylicia Rashad, Rob Reiner, and William Sadler. 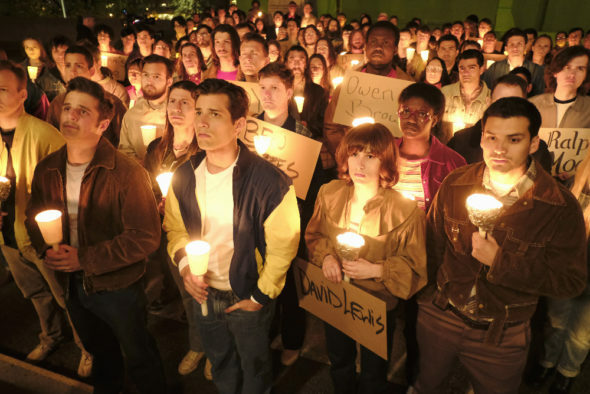 From Dustin Lance Black, the When We Rise TV show chronicles the leaders who agitated for LGBT rights in the US Civil Rights movement. The mini-series follows LGBT activist Cleve Jones, women’s right leader Roma Guy, her wife and social justice activist Diane, African-American community organizer Ken Jones, and transgender activist Cecilia Chung. In 1972, as a young Quaker from Arizona, Cleve Jones (Pearce) joined the gay liberation movement and was mentored by Harvey Milk. Eventually, Jones would go on to found the Names Project AIDS Memorial quote. He also led the 2009 March for Equality. When African American Vietnam vet Ken Jones (Williams) joined the movement in San Francisco, he had to deal with racism from other gay men. Through the years, he worked to diversify the movement, organized resources for homeless youth, and promoted AIDS awareness. Hailing from rural Maine, lesbian Roma Guy (Parker) is a social justice worker who co-founded the San Francisco Women’s Building. As Public Health Commissioner, she later lobbied to bring healthcare access to all San Franciscans. Currently, she is working as a criminal-justice activist. A mother and grandmother of three, Guy’s wife, Diane (Griffiths) joined the Women’s Movement in the 1970s in San Francisco. She too co-founded the Women’s Building and has worked as an HIV/AIDS nurse and social justice activist at San Francisco General Hospital for 33 years. After Ken is diagnosed with HIV-AIDS, he loses his home and his health starts to decline. Cecilia Chung (Aquino) helps him get into a VA hospital to receive the treatment any veteran deserves. Eventually, Cecilia will become a health commissioner and work with Ken to get the city to help fund a meal program for one of the first LGBTQ inclusive churches. It’s 2008, and in the face of California’s Proposition 8 stripping away the right of gays and lesbians to marry, a newly energized Cleve inspires a younger generation to organize a massive march on Washington D.C. to demand full, federal LGBTQ equality in all matters. Meanwhile Roma uses her lessons learned as a women’s and LGBTQ activist to fight for healthcare for all in San Francisco. And as Ken struggles to reconcile his sexual orientation with his love of God, he recruits his old friend Cecilia Chung, now a health commissioner, to get the city to help fund a meal program for one of the first LGBTQ inclusive churches in the nation. With newfound political pull, Cleve joins a rag-tag group of activists attempting to overturn California’s discriminatory Prop 8 at the U.S. Supreme Court. Ken finds his calling in helping bridge the gay/straight religious divide, and Roma defies her youthful distaste for the institution of marriage and proposes to the woman she’s loved for decades, Diane. In the end, all of their fates hang on the decision of nine justices in the nation’s highest court. First aired: March 3, 2017. What do you think? Do you like the When We Rise TV show? Should ABC let it stand as a mini-series, or bring it back for a second season somehow? This is a true story and I feel society deserves to see and understand the serious struggles the LGBT community has gone and still continues to go through. It would be a shame if this series won’t continue. This series is important for all of those that do not understand what some of us have had and continue to go through just to attempt to live as normal as possible. Hope it will continue !! Truly the best series ever presented on tv telling it the way it is…I applaud ABC for their effort and courage to present such a show. I hope this continues!! I believe in the mini series! It should continue!!!! My son is gay and is STILL GOING THROUGH ALOT OF THESE ISSUES. Who plays Supreme Court Justice Antonin Scalia?